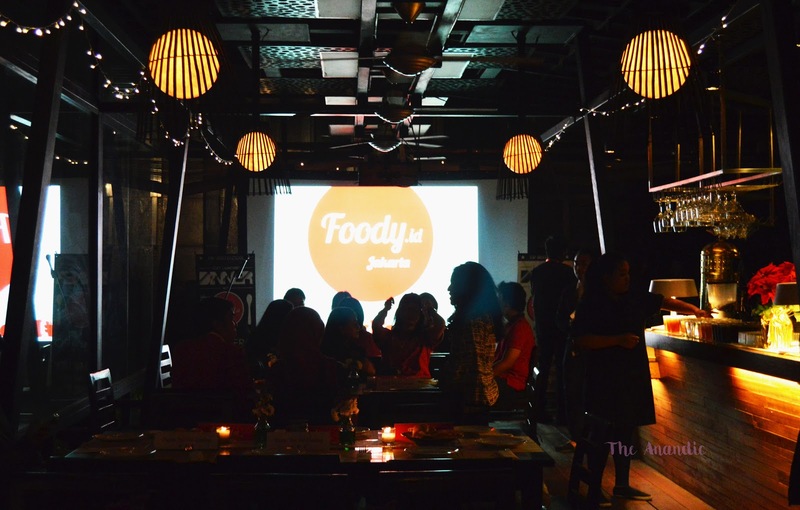 Last week i'm invited as one of VIP guests at Soft Launching Foody Indonesia. 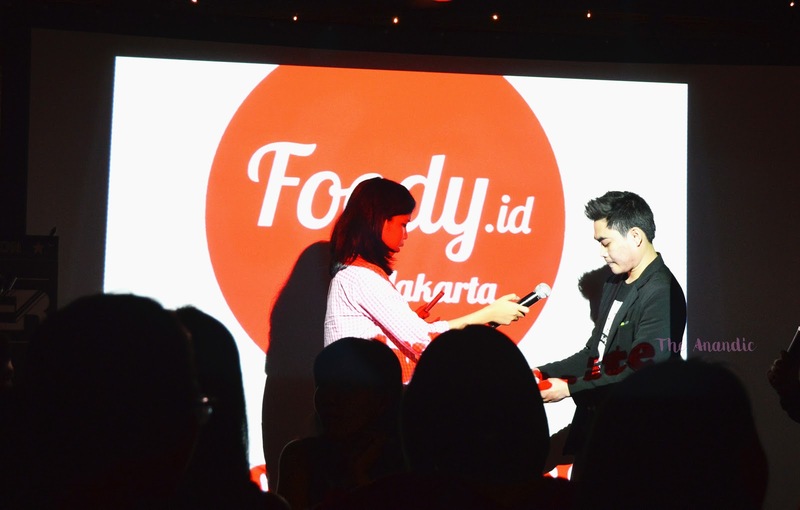 Foody is a Vietnam-based culinary and restaurant listing startup, and now expand to Indonesia, and they choose Jakarta / Jabodetabek as their first city. As for the party i came with my partner at 6 pm, after making registration, me & partner got a chance to take a picture at foody photobooth corner, we can choose many attributes about food here. Then the staff kindly led us to our seat and the welcome snacks are already served. For the welcome snacks it consists of cheese stick, Friend Wonton, and Bread. I didn't try the Fried Wonton but the cheese stick and bread quite tasty. 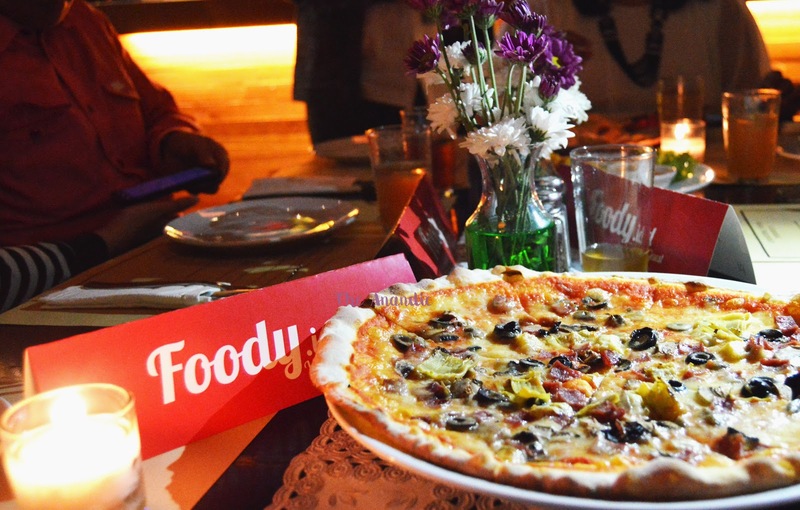 The party started at 7 pm, they explain about Foody as culinary startup company (also at that time the waitress serve pizza as appetizer). 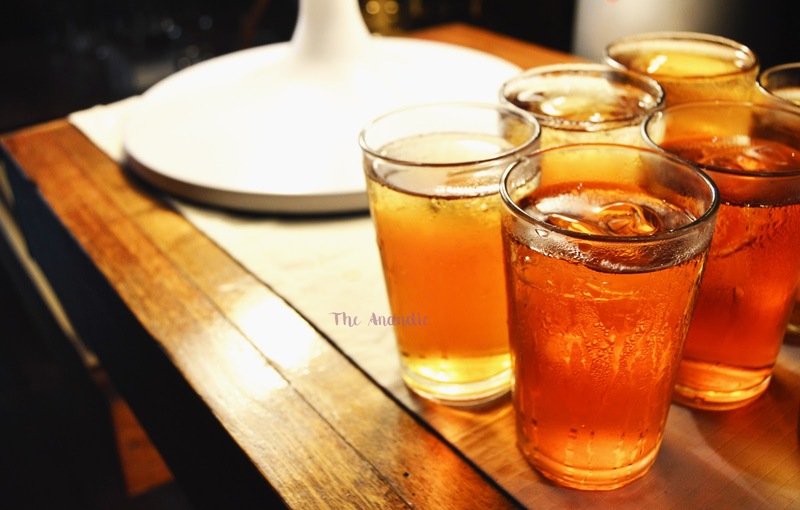 Foody is a Vietnam-based culinary and restaurant listing startup, and there's some difference between Foody and other culinary startup company. The difference are... in Foody every time you write a review or add place, even just commenting on other user review your will gain reward point (in rupiah), and will automatically be in your Foody E-card (if i'm not mistaken). 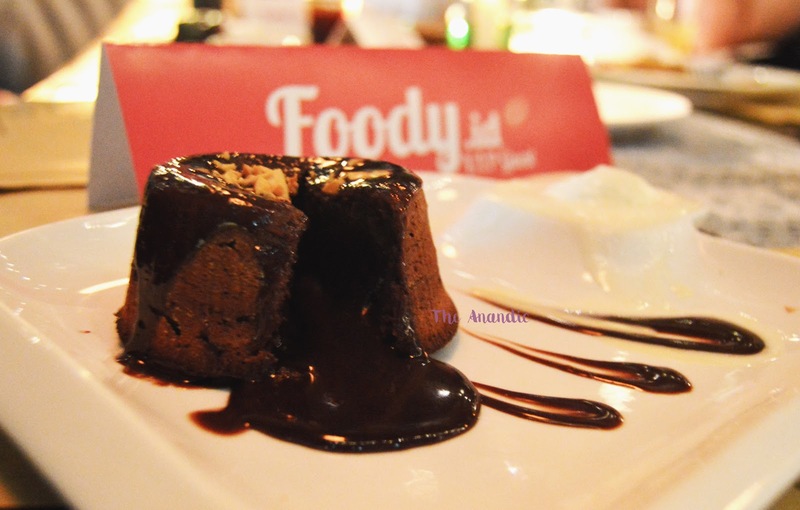 You can redeem that reward point to food voucher at Foody restaurants partner. Sounds great, rite? you may register on http://www.foody.id/ or download Foody Mobile app at Apps Store or Google play. While waiting for the main course to come in, the magician came on the stage to entertain us with his magic tricks, it's quite entertaining and funny (well because one of his trick were fail, lol). For the main course we can choose one of five menus that has been provided by staff, but all of them are pasta. 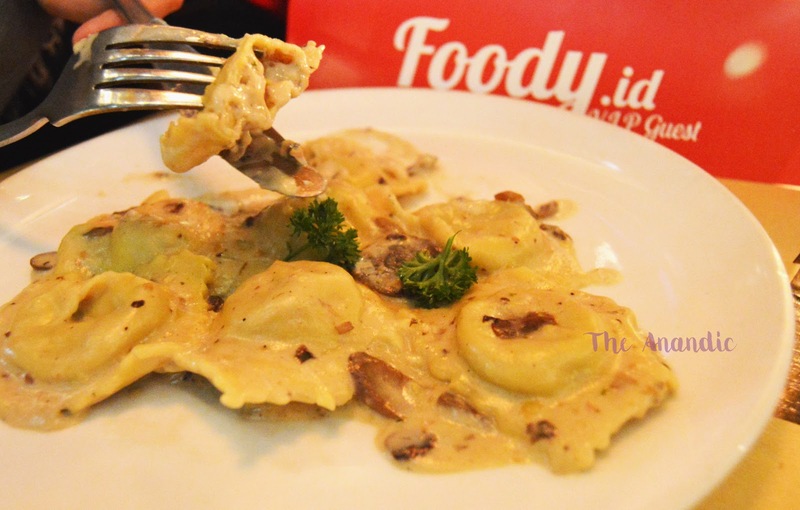 I choose Ravioli Di Carne Ai Funghi, it's homemade ravioli pasta stuffed with beef and spinach in mushroom cream sauce. I must say it's not my taste, it's tasteless for me because i can only taste the creamy sauce. as for the dessert we also can choose one of five menus that has been provided by the staff, there's Tortino, Creme Brulee, Pannacota, Affogato and Nero Crepes Mascarpone. I choose Tortino, it's a warm molten chocolate cake with vanilla gelatin. The tortino really delicious, chocolate cake really soft and i loveeee how warm chocolate spill out of the cake! 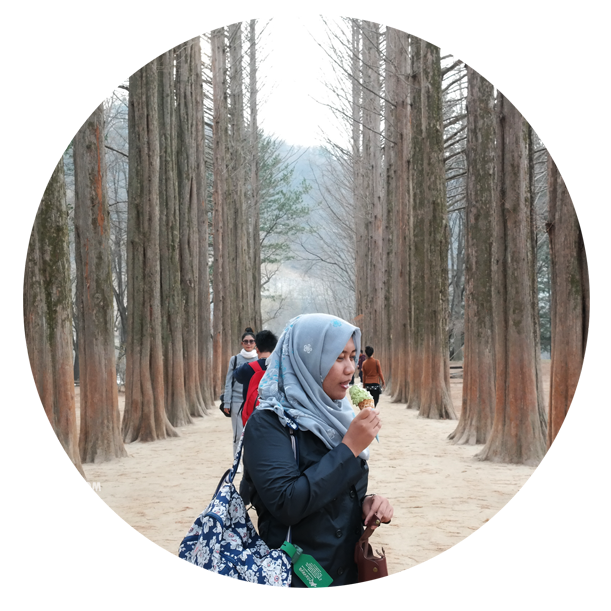 More info about foody indonesia, watch this video! yes, because it's thin crust pizza..
WHAT A GREAT PARTY! How can I join Foody? Sounds interesting, mb. They're hiring now! let's join, mz!